Naturally produced by the body, chondroitin is an essential component of cartilage It is also found in the bones, skin, cornea and arterial membranes. It plays a crucial role in building and maintaining cartilage tissue, ensuring that cartilage retains water, as well as its elasticity and strength, and that the joints remain supple. While its mechanism of action is not yet fully understood, we do know it promotes the reconstruction of cartilage by partly inhibiting hyaluronidase, the enzyme responsible for its destruction. It’s also thought to inhibit osteoclasts, key cells involved in the loss of bone substance, as well as to play an active part in the inflammatory process and to increase synthesis of proteoglycans and hyaluronic acid, the gel which lubricates the joints. Chondroitin supplementation: what are the desired effects? Over the last few decades, chondroitin has been the subject of several studies and meta-analyses which have confirmed its efficacy not only for relieving symptoms of joint problems (particularly those of arthritis1) but also for helping to slow down their development2. These are significant conclusions as joint problems are often seen as both inevitable and untreatable. However, while there’s still no 100% effective treatment, there are number of ways of obtaining relief. The simple act of not giving up, continuing with your daily activities despite the pain, not giving in to negativity, already constitutes an effective form of treatment. Other natural solutions such as chondroitin, along with Arnica gel and Boswellia extract (available from Supersmart as Super Boswellia), are very helpful in improving mobility and perception of pain. Chondroitin is a molecule which also offers preventive benefits. Today, those of us who live in affluent countries have a worryingly high risk of developing arthritis – 25% for arthritis of the hip1 and 45% for arthritis of the knee2. Most people are largely unaware of the preventive options available, including chondroitin, particularly relevant for those with a genetic predisposition. Since such individuals carry genetic abnormalities which increase their likelihood of developing the disease (including mutations connected with collagen composition), they need to be especially careful about lifestyle factors (excess weight, physical inactivity, poor diet and stress) in order to maximise their chances of avoiding the disease. We raise this point because chondroitin is a very large molecule. While products with a low molecular weight (of less than 16,000 daltons) can be absorbed completely, absorption of the largest molecules may be between just 8% and 18%3. This rate of absorption is still sufficient, however, to ensure that the chondroitin delivers clinical benefits for joint health. Be aware though that tests have shown some supplements to contain very little chondroitin due to its high cost. 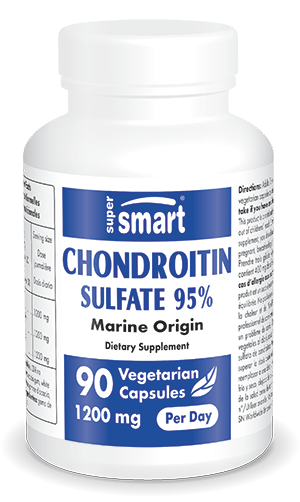 This is not the case with Chondroitin Sulfate 95% (400 mg) which remains unquestionably the best product on the market, as a result of its marine origin raw material, its pharmaceutical quality and its active principle concentration evaluated at 95%. The recommended dose is 3 vegetarian capsules a day, preferably taken with food, which is equivalent to a daily dose of 1200mg. Each capsule contains 400 mg of Chondroitin sulfate. Adults. Take three vegetarian capsules per day (one with each meal).